A symbolism for dim bluntness, gray has always been considered an inconvenient choice for а prevailing color in web and print design. Gray is a color emerging on the borderline between two highly contrast colors. It’s achromatic entity takes a neutral position among other color palettes being considered as a sign of absence. Gray is the color with no colour inside on the line amidst the powerful absorbing Black and the sheer and elegant White. In antiquity, grey had become a representation of social status. Being the color of undyed wool, gray has been worn mostly by peasants. In the Renaissance and Baroque era, the color Gray has become an important background color in Grisalle painting and the work of famous artist, such as Rembrandt and El Greco. Being an excellent highlighting color for gold shared and skin tone, as well as a harmonious addition to both black and white, gray has been a prime choice in both art and fashion. In the 20th century, gray grew to become a predominant color in modern architecture. Today, different shades of gray are used widely in all forms of design, including web, print and textile. Gray’s been used as a prevalent color in minimalism as a symbol for clarity and a highlighter for both saturated and pale color palettes. While print design and photography widely adopt gray shades, the excessive use of gray in user interface design has remained a taboo. Being used with a thing layer of washed out colors in minimalist web design, gray has been accepted as a prime signal for inactivity. Yet, the popularity of minimalist art has started integrating gray shades in a wide array of design branches, being a symbol for stature and purity. It has been a prime color choice for big names like Apple and appears to an audience which favors figurative simplicity ,rather than boldness, in its style choices. The interactive use of gray in this design company website provokes visitors to search for color. Rather than aiming to grab attention with illustrious artwork, this website relies on simplicity to positively affect user behavior. 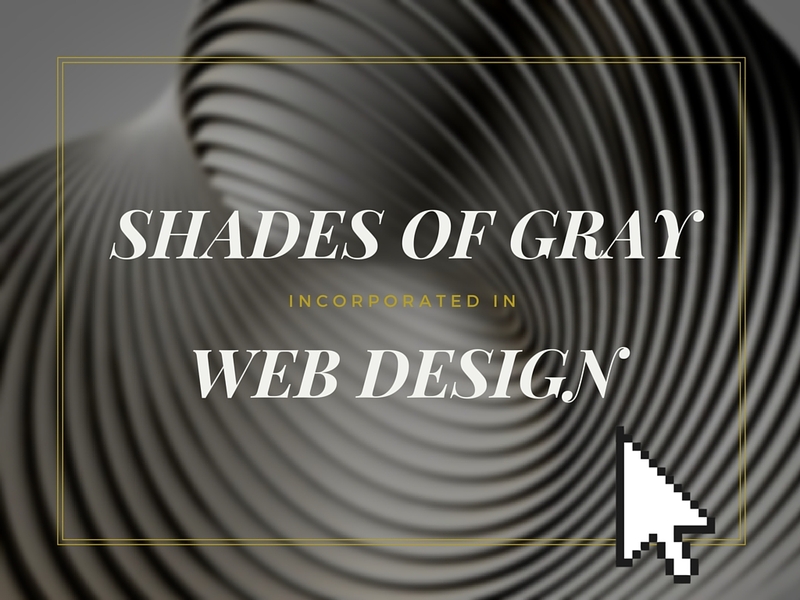 Widely used as background color for golden shades in Renaissance and Baroque, gray presents the perfect option for predominant color in luxury web design. Being a sign of high social status and wealth, the combination of black, gold and gray is a powerful tool for attracting users who search for affluence rather than mere simplicity. Used as a symbol for bluntness and poor stature, the gray shades incorporated in the NoLeath website are an interactive tool for capturing user’s attention. The transition between the gray image and the color-rich shoes exposition which makes a strong statement showing the high contrast between the peasant color and the highly saturated shoe designs. The Nizo website perfectly incorporated the use of gray in minimalist design. The gray background, strict arrangement and pale object coloring are a triumph of minimalism built within the borders of modern web design. When it comes to cyber security, the predominant achromatic appearance of the website aims at representing the “gray” area of the web, where insecurity is represented by dark gray shades while creative solutions use yellow as symbol of creativity in problem solving. One of the most famous examples of the use of gray as product background which speaks of minimalism and style is the My Own Bike wbeiste. The site design wisely adopts gray’s highlighter qualities in presenting a clean product design which attracts the right audience with the website’s elegant simplicity. The website design of the Riga Ghetto Holocaust Museum uses gray as a powerful statement and reminder of the forgotten faces from the holocaust. It is a window into the story of Riga Ghetto which incorporates gray to depict distant memories and tragedy in a beautiful, sensuous and provocative way. The website of the Chech beer White Frontier is an gorgeous example of the use of gray as a highlighting background, which have been creatively intertwined with artisan elements and contrast colors creating a feeling of timeless quality and high-standard craftsmanship.